I woke alone sprawled diagonally across the bed. It was 6am. I was in Melbourne for the Queens Birthday long weekend without my husband Justin or my children. I had hoped to sleep in but old habits die hard when you have children. They wake early and a flurry of activity usually ensues. As a result, I usually “snap” awake in the mornings. 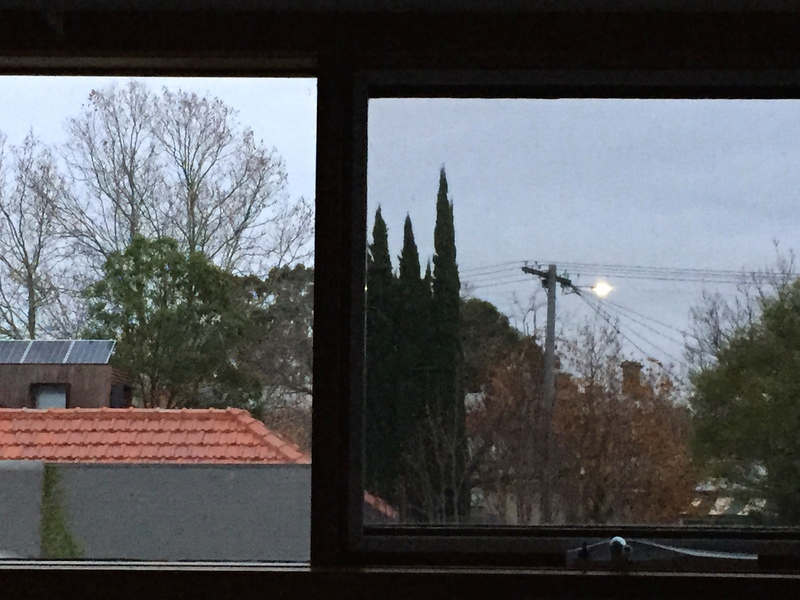 The cold light of early morning in Melbourne. The bed that I share with my husband is extremely comfortable but there is the issue of stealing the covers off one another in winter. And the snoring. I have to admit that I have been guilty of both. Consequently, I enjoyed the rare luxury of silence and electric-blanket induced warmth. I began to plan the location of my meetings (and meals) today with cycling people in Victoria. The owners of the Airbnb apartment had thoughtfully provided provisions. Stephen came over and we had egg soldiers together. And we were off. The first planned stop was a bicycle shop nearby. I wanted to hire a good quality bicycle for a long ride that he had suggested around Geelong. The many bicycle shops around Fitzroy North seemed to all be thriving. So many bicycle shops to choose from! Stephen is dressed stylishly with Barbour jacket. Giant bicycle. In search of road bicycle, we rode along the Inner Circle Rail Trail. Stephen explained that this trail, part of the network of shared use bicycle paths, is a converted steam-era suburban rail line. It was busy with pedestrians and cyclists. I nearly caused an accident by stopping on the trail on the wrong side and then not looking before setting out. I was embarrassed and amazed. “Spot the Sydneysider,” I thought. Riding on the Inner Circle Rail Trail after nearly causing an accident with other cyclists. J.Crew dress and coat. Geox tall boots, Yakkay helmet, BBB gloves, fake fur scarf, Witchery sunglasses, Linus Eleanor bag, Gazelle Geneve. The bicycle shop couldn’t assist but a young woman in the shop recognised me. When she told me who she was, we both laughed and embraced. Cat is the daughter of a bicycling colleague in Sydney. The prior week, I had contacted her by email to attend her Wrenchworthy workshop in Reservoir on Sunday. But the allure of a long ride was too great. I would attend another time. She was very warm like her mother and offered me her bicycle, a Surly Straggler, for the day. I had to accept as it was a generous offer. I arranged to pick up the bicycle from her later in the evening. By now the temperature had risen and I took off my jacket. Our next stop was to meet the head of Cycle, the Australian cycle alliance. I met Edward Hore and his wife Rosie at Mitte. We had a great chat and discussed this blog, Cycle and some potential collaboration opportunities. I thought I would interview Edward for a bit of fun. A funny moment, one of many, with Edward and Rosie. Attached is a link to the interview. After the interview, they showed me their bicycles. Instead of departing by car, we cycled in separate directions like kids. “How wonderful to behave like a kid again. Such freedom!” I thought with a smile. Off to our next meeting. J.Crew coat, Geox tall boots, BBB gloves, Yakkay helmet, Gazelle Geneve circa 2011. I started thinking about the differences between Melbourne and Sydney while riding to lunch with Stephen. Melbourne is a slightly smaller city and less hilly. 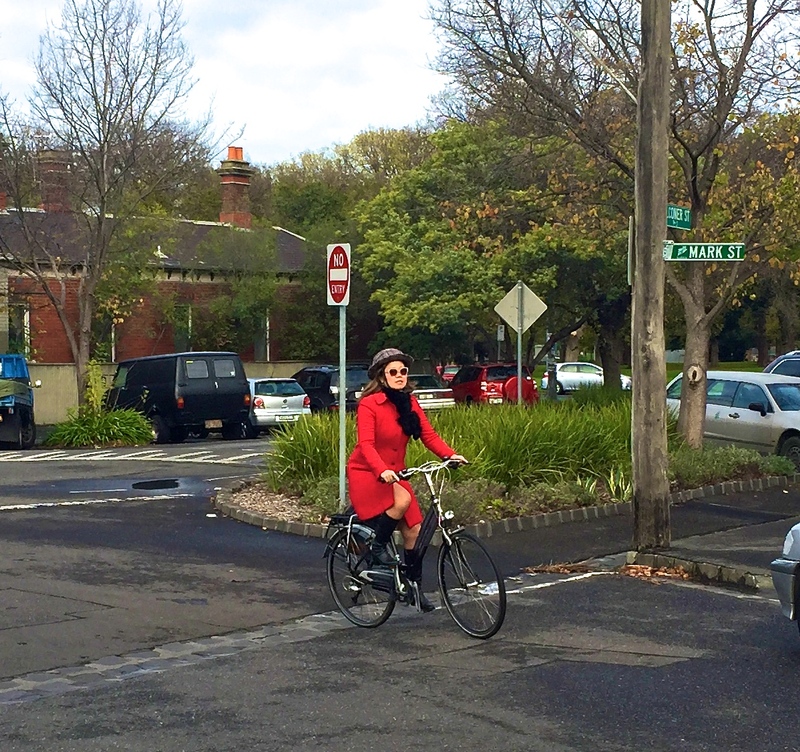 At first glance, it seems to have a more advanced cycling culture than in Sydney. Certainly, the cars seemed calmer. Fitzroy North was doing its best to show me how comfortable it could be. But later on a Gelato Messina run to Smith Street and a near-miss en route to a party in Fitzroy, I realised that it is a pocket of comfort. Melbourne has “inner suburbs” and “outer suburbs.” Gary from the bicycle shop Spokes mentioned that the “outer suburbs” are where cars are more prevalent and bicycles much less so, a situation similar to Sydney. But then it was time for lunch. At Cavallini, Stephen and I devoured lunch and shared a raspberry and white chocolate cake which was gone in seconds. We had been cycling all morning. It was a great excuse to indulge. The benefits of cycling with a local were to be proven again. I had wanted to see some second-hand clothing shops in Melbourne. Stephen pointed out that Bruce was just down the street from Cavallini. We strolled there and I spotted some beautiful winter coats. I tried on five. I stayed away from the traditional “Melbourne black”. A royal blue Marc Jacobs sang it’s siren song for me in a beguiling tone. At $399, I was tempted but I had just spent a bit more than that to correct my “sh&t-for-brains” airline tickets with completely incorrect departure and arrival dates. Stephen even complimented me on the colour. I would think about this coat for the rest of the weekend. It still makes me sigh with regret. The shop was beautifully curated and the clothes in perfect condition. Chatting with Chris Starr and making her smile. 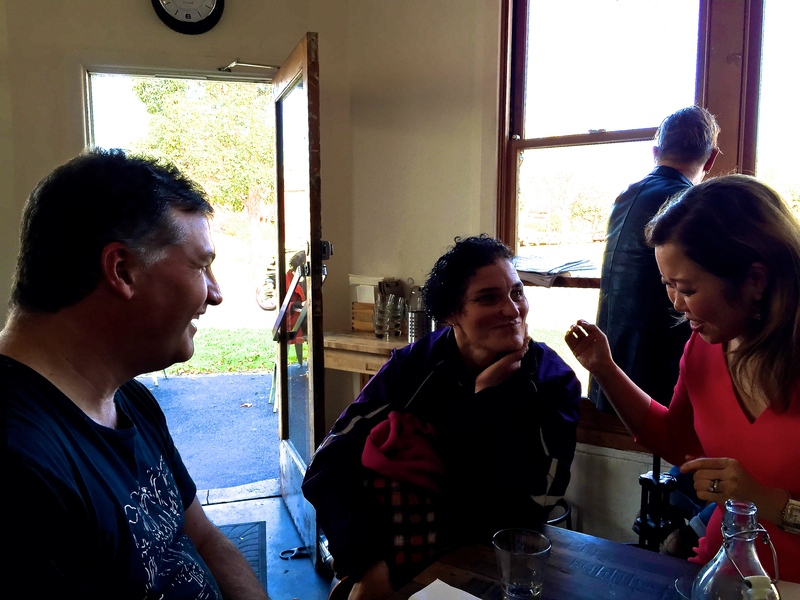 We narrowly escape by returning to Cavallini in time for a radio interview with Chris Starr of YarraBUG. The show airs on 3CR community radio on Mondays. I also met her broadcasting (and life) partner Steve. 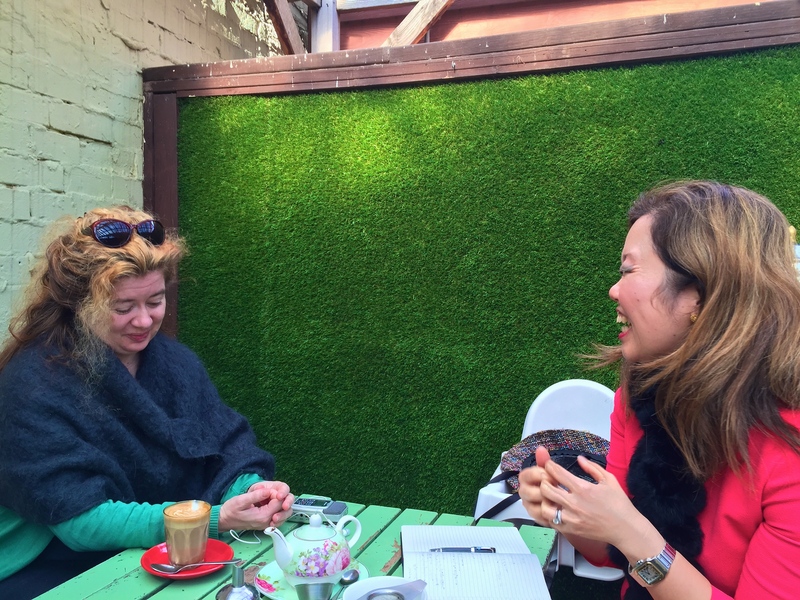 When I started to speak about cycling in Sydney, she stopped me and suggested that we save that bit of the conversation for the interview. I could understand how the spontaneity of the interview could be marred by previous mention of the subject matter in conversation. Having never done a radio interview before, I was fascinated to know how it would proceed. The link to the podcast is attached. Lastly, I interviewed the interviewer. It was great fun! I sent Stephen home after this meeting. I would see him later to pick up Cat’s bicycle. I found my way to El Chino to meet another gentleman of bicycling, @BicycleAdagio. He was beautifully dressed and accompanied by his lovely dog. We chatted in the garden of El Chino sitting next to a chiminea to ward off the increasing chill of early evening. He admitted his preference for Melbourne over Sydney and could back up the preference having lived in Sydney. 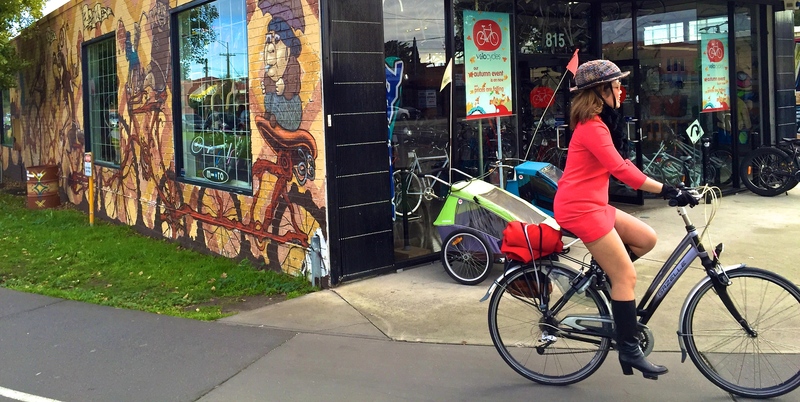 We talked about cycling with kids on cargo bicycles, which are more prevalent in Melbourne. I`wanted to meet him because of his large Twitter following, something to which I aspire. I could have stayed all evening chatting. He was supportive of my blog and the every day cycling that I promote. In the end, I was the one who had to depart. I needed to pick up Cat’s bicycle and dress for the Knog party. He promised to get in touch when he was next in Sydney. Velvet jumpsuit and heels-clad, I found the GoGet car not far from my apartment. GoGet is a car-share program to which Justin and I belong in Sydney and it has expanded to other cities in Australia. I picked up Stephen and we went to Cat’s house. The funny thing about this jumpsuit is that the heels make the entire outfit. Otherwise, I think that it looks like a onesie missing a hoodie and ears. I explained this to Cat, in her foyer, while I was changing from heels to cycling shoes to test the fit of her bicycle. We had a good laugh about it. I invited her along to the party but she was tired and was looking forward to a good night’s sleep. Interestingly, while driving, I noticed that width of the car lane is the same as the bicycle lane in Fitzroy North. Another means of calming drivers, I suspected. Back to the apartment on Falconer Street to drop off Cat’s bicycle. Then to return the car to its parking spot. I had parked the Gazelle next to the spot to ease the journey to the Knog party via Stephen’s house. All the too-ing and fro-ing that Justin and I do with the kids on bicycles was good practice for this weekend. “Zip-zip!” as Stephen said. 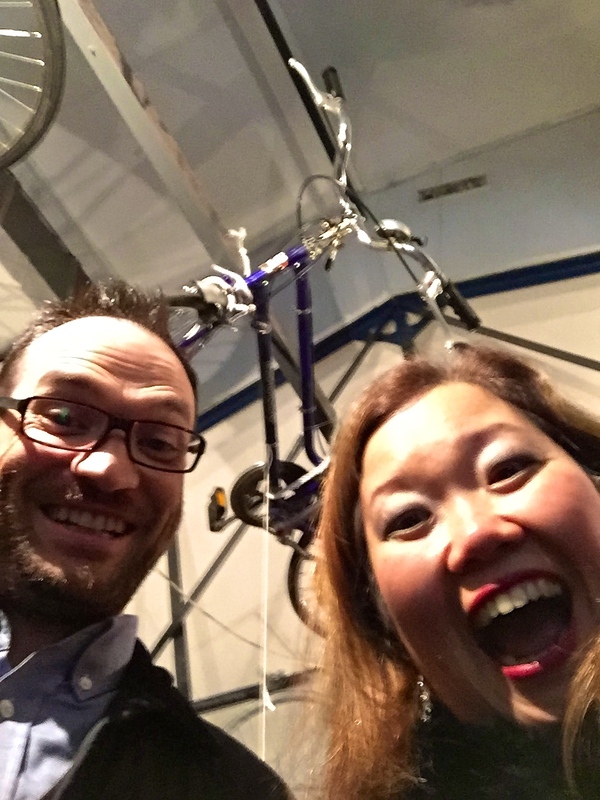 We picked up Stephen’s bicycle and rode to the Knog event in Fitzroy. It was a more urban but lively. The only problem was a car that nearly hit Stephen. I did a quick intake of breath as I saw the car approaching too quickly while the lights were red. My brain was processing what I was about to see, a car about to hit my friend. Stephen had slowly rolled to the intersection and was preparing to cross. My cautious (mum-like) practice is to hang back when I’m with kids and alone on bicycle. The car stopped a few centimetres away from Stephen with a squeal and a skid. Stephen stopped. Then the car went around him and continued. The light still red for the cars, I proceeded. “Are you ok?” I asked Stephen whose face was now ashen. “The car scared the sh&t out of me.” He said. “Do you want to stop?” “No. It’s ok. Let’s go.” As we proceeded, there was a spaghetti of cars parking, waiting to park, pulling out in the next block. Stephen said that he had regretted taking me this way to Fitzroy. I could see what he meant. 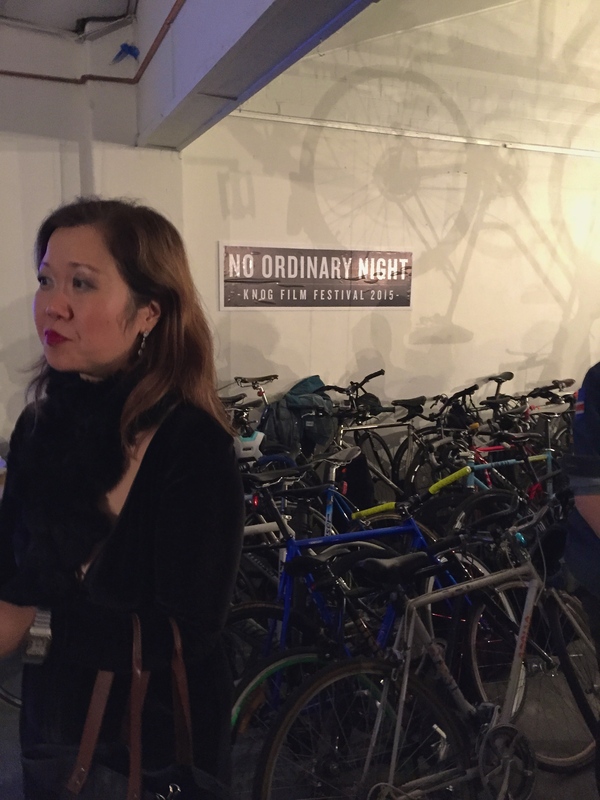 Free bicycle parking at the Knog Film Festival! ASOS black velvet jumpsuit, Geox heels, Swarovski earrings. We eventually made it safely to the party. We even parked our bicycles inside the venue, a small warehouse. It was noisy and packed with twenty-something men. A fantastic art installation of bicycles suspended from the ceiling caught my eye. There were very few women. I could see that my velvet was out of place. I chatted with the photographer who pointed out the head of marketing. We had a brief chat and exchanged cards. It was an imperfect meeting place but enough for an introduction. The movies were amusing. The winning movie from Bristol was superb. Bicycles above! Each was individually labeled. A great use of the space. Stephen and I left the party super hungry. We had an 84.4km ride waiting for us tomorrow. We ordered the banquet and ate like kings at the Moroccan Soup Bar. We finished everything in sight. I shan’t bore you, Dear Reader, with the details of the ride from Geelong. Except that by the end, with the imperfect fit of a fantastic borrowed bicycle to contend with, I vowed to my numb perineum – never again. I will take my own road bicycle to Melbourne next time. And lycra while waiting on a train platform in six degrees celsius is never a good combination. Nor is drinking half a bottle of wine with semi-cold pizza afterwards. I woke at 2:30am needing to vomit. Monday late morning, I returned Cat’s bicycle and met Stephen for a giant lunch at El Chino. My famous “sense-of-no-direction” made me late as I went the wrong way three times. For dessert, we went to Gelato Messina on Smith Street. There were more drivers here who reminded me of Sydney. Bicycling was more hazardous here with the tram line, parked cars and cars with which to contend. We returned to Falconer Street and Gary from Spokes met us to pick up the Gazelle Genève he and his wife had loaned me for the weekend. We had a great chat and planned to meet in Sydney next time. In expectation of our giant lunch slightly hung over, definitely dehydrated and super hungry. Leona Edmiston dress. Stephen looks great! The cold in Melbourne makes it possible to dress well. P.S. A giant thanks to Gary at Spokes in Abbotsford, Paul at Gazelle Bicycles Australia, @BicycleAdagio, Cat Calypso at Wrenchworthy, Edward and Rosie Hore of Cycle, and Chris Starr of YarraBUG 3CR radio. And to Stephen! What a fun trip! 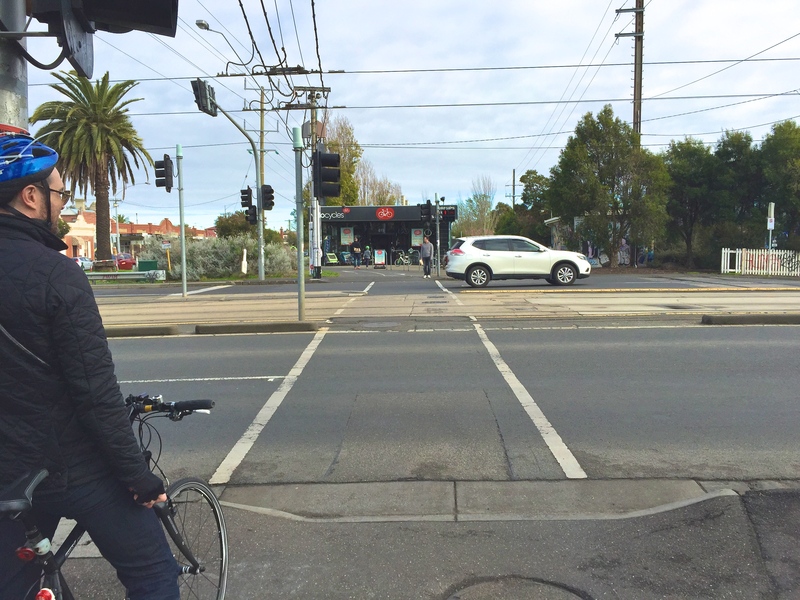 I loved living (and cycling) in Melbourne, but was always very wary of the tram tracks which are just the right [wrong] width for bike tyres! So glad you got the sense of how much fun the weekend was! I saw my brother once get stuck in tram tracks around Chinatown. He likened the sensation to mountain biking. I too find the tram tracks scary but you have to remember to look where you want to go not where you don’t want to. It sound obvious but those tracks can just draw your eye if you are not cautious. Sound like a fab weekend, sorry we could not be there with you but the kids did love camping! 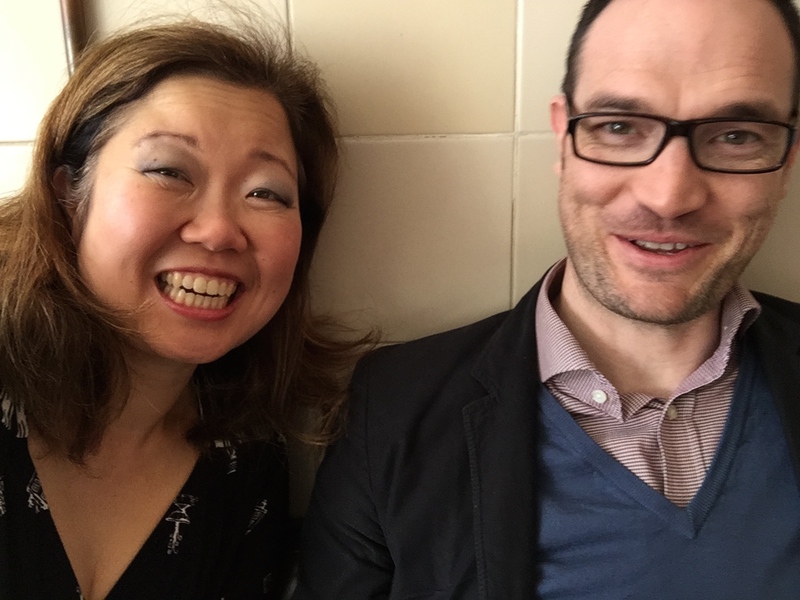 Thank you Sarah, it was wonderful to meet and partake in each others interviews, dos-à-dos style 😉 Please let us know the next time you’re in Melbourne. It was a great time! Planning to be in Melbourne again early August. I’ll be in touch!